Researchers have developed a drug that offers new hope to those suffering from asthma or chronic obstructive pulmonary disease (COPD). The new medicine, called RPL554, works by blocking two enzymes in the body and can help to relax the airway muscles as well as reducing inflammation in sufferers. Experts say the drug could revolutionise the treatment of asthma and COPD as it does not have any of the substantial side effects of current treatments. A new treatment with minimal side-effects could encourage asthma sufferers to travel more - however before doing so they should be sure to arrange asthma travel insurance. A trial carried out across three countries - the UK, the Netherlands and Italy - found that RPL554 relieves patients of symptoms and also has an an ti-inflammatory effect. After a week of treatment, COPD patients were able to forcibly exhale a 17% higher volume of air after breathing in deeply than before. The researchers said participants in the trial - both the placebo group and sufferers - had a good tolerance of the drug, and only mild side effects were noted. RPL554 treatment also did not cause any of the stomach issues linked to current asthma and COPD drugs. Treatments for these conditions have remained largely the same for the past four decades, although experts started to doubt their effectiveness after they were found to worsen asthma symptoms and fail to protect from flare ups. Dr Samantha Walker, director of research and policy at Asthma UK, described the new drug as "unique" because it has two effects at the same time. She said the 250,000 people in the UK with severe asthma urgently need better medication, adding that current treatments come with a range of "unwelcome side effects" such as osteoporosis, sleep problems, weight gain and depression. 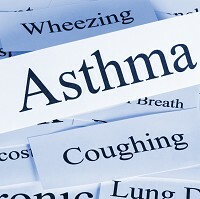 Asthma UK will watch the development of RPL554 "with great interest", Dr Walker said. The findings of the study have been published in the journal The Lancet Respiratory Medicine.